The concluding volume in the story of Yaichi, his daughter Kana, and how their meeting Mike Flanagan—Yaichi's brother-in-law—changes their lives and their perceptions of acceptance of homosexuality in their contemporary Japanese culture. As Mike continues his journey of discovery concerning Ryoji's past, Yaichi gradually comes to understand that being gay is just another way of being human. And that, in many ways, remains a radical concept in Japan even today. In the meantime, the bond between Mike and young Kana grows ever stronger, and yet he is going to have to return to Canada soon—a fact that fills them both with impending heartbreak. But not before more than a few revelations come to light. GENGOROH TAGAME was born in 1964 and lives in Tokyo. After graduating from Tama University of Art, Tagame worked as an art director while writing manga and prose fiction, contributing illustrations for various magazines. In 1994 he cofounded the epochal G-Men Magazine and by 1996 he was working full-time as an openly gay artist. He is the author of dozens of graphic novels and stories which have been translated into English, French, Italian, and Korean. His artwork has been exhibited in galleries across Europe and America. 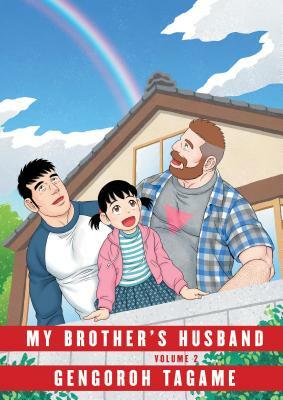 My Brother's Husband, Volume 1 marked his first all-ages title, and earned him a 2018 Eisner Award, as well as the Japan Media Arts Award for Outstanding Work of Manga from the Agency of Cultural Affairs.